Vice President Joe Biden is the keynote speaker at next month’s Iowa Democratic Party’s fundraiser. The Iowa Democratic Party’s Jefferson-Jackson Day dinner is an annual event. 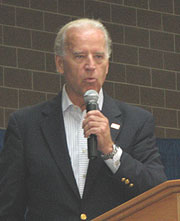 The 2007 edition attracted a crowd of more than nine-thousand who gathered in Veteran’s Auditorum in Des Moines to hear speeches from all the Democratic presidential candidates, including Biden, who was seeking the top spot on the ticket back then. Biden opened his speech by saying, “Hello, Iowa and hello Chicago” — suggesting many in the room who were supporting Obama had been bused in from out of state. Now, nearly two years later, Obama’s Vice President Biden will be back in Iowa as the keynote speaker at Jefferson-Jackson Day event, scheduled for Saturday, November 21. Biden has been the keynoter at this event before, in 1985 and again in 2000 when Biden spoke for over an hour and a half.